This was a great print. Took a while to figure out what went where, but eventually I figures it out. parts A, B, D, J and K, 4 times each; parts C, E, F and G, 2 times each; parts H, I, M and N, one time each; part L, 8 times. A and B (4 each) are the first body. D (4 times) is the second body. J (4 times) is the third body and. K (4 times) is the fourth body. Start by glueing each body together taking care each one is squared. Parts C, E, F and G (2 each) are the firts floor. H and I (1 each) the second floor. M is the third floor and N the fourth floor. Now take the first body and adjust and glue the two C parts and E parts. Center and glue the second body and then complete with the ceiling of the first floor (parts F). Adjust and glue the second floor to the second body. Then you can glue this to the rest of the tower (is near complete). Finally, glue together all the pieces of the top floor. H is the second floor. In top of it there goes J parts (4 of them), then M (1 piece) and then K (4 pieces). E parts (4 of them) are the windows for the first floor. Once the first floor platform is glued together, the windows (parte E) are glued to it and the floor roof parts complete the first floor assembly. Once you have printed all parts, start from the bottom up. put in place two parts together with small clothing hanging clips and once you are satisfied with the adjustment, secure the parts with a couple of drops of liquid super glue, and so on. Keep in mind that some parts have curved edges (second and third tower sections) and those need to be thermoformed to fit (lightly warm the parts secured together with clips with a hair dryer) and then apply glue. Proceed slowly and with care and it's fun to watch the tower growing up. I did overlap the corners of parts A and B. It's a little bit asymmetrical but once it's finished it looks just fine. Highly detailed model, 85 cm. high (true 1:400 scale) designed directly from the original blueprints. The model was built from 52 pieces, most of them 3D printed flat and glued together. Some of the pieces need light thermo-forming to adjust the curvature of the assembly and avoid printing with support. All pieces of the model can be printed in a 20x20 cm. 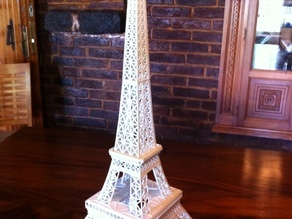 printing bed, but if you have a larger printing bed the model can be scaled up to build a huge and beautiful tower. The prototype was printed in PLA using 0.2 layer height and printing speeds between 20 and 40 mm/s depending on the detail of the particular piece. All pieces print without support. The model is very easy to print and fun to assembly together.